Jeffrey Ritter, Georgetown Law, Mapping the Law: Building and Using Visual Mindmaps in Legal Education from Michele Pistone on Vimeo. Very interesting presentation. 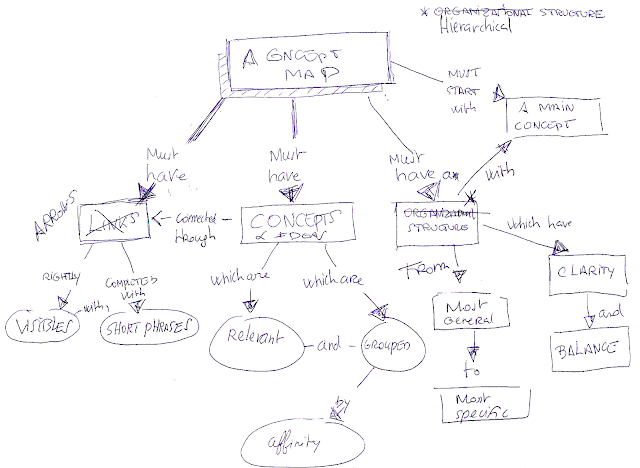 Concept maps work well when the concepts fit into a nice, neat hierarchy. Many times, we would like to show associations to concepts outside of the hierarchy but the concept map ends up having a lot of crossed lines and is hard to understand. There is a software tool called the "Idea Shuffler" that works well with both hierarchical and non-hierarchical structures. The tool supports layers of interconnected diagrams, single click supporting documentation, and automated location of concepts. By the way, this tool has been used to organize and understand the information in a complex legal case.